Since independence India has traditionally shied away from joining security based pacts or military blocks. Chanting the same mantra, India refused to join ASEAN when membership of the ASEAN was being offered to India as a founding member. India’s political leadership at that time naively but wrongly assumed that the ASEAN is a successor organisation to SEATO (South East Asia Treaty Organisation). A non-aligned and pacifist India used to reflexively sermonise against military pacts in international fora. In the last decade or so, we have surprisingly grown fond of calling every bilateral relationship as “strategic partnership” devaluing the concept of strategic relations. However, this initial geo-strategic reticence and subsequent schizophrenia of Indianforeign policy is bound to change after the fifth summit of the BRICS in Durban, South Africa on March 26-27th 2013. India must remain aware that following improvement in bilateral relations between India and US, both Russia and China have grown concerned about India’s strategic intentions and aspirations though for entirely different reasons. Moscow is miffed because India no longer offers a ready and automatic market for Russian substandard military hardware. Starting from a catchy acronym (BRIC) coined in 2001 by Jim O’Neill, an international banker from Goldman Sachs, the grouping of four emerging economies has evolved and enlarged. Russia under Putin became the prime mover of the BRIC as previously in 1990s, former Russian Premier Yevgeny Primakov had already suggested formation of RIC (Russia, India, China) grouping directed against the US. Owing to divergences in respective national strategic interests, RIC never became prominent. Primarily the BRICS has remained merely as a “talking shop” with economic agenda hoping to replace the Western dominated Bretton-woods institutions. India has persistently articulated the need to establish a “BRICS Developmental Bank” but differences in perceptions and power motives have prevented it from materialising. Last enlargement of BRIC to BRICS was smartly schemed by China during the Beijing Summit in 2011 in order to make IBSA (India, Brazil, & South Africa) grouping irrelevant. South Africa aspired to join the BRIC but was nowhere near any of the four emerging economies club members economically. China had felt excluded from the group of three large “developing democracies” and unilaterally invited South Africa to the BRIC summit. There are others who may be interested in joining the BRICS. Egyptian President Mohammad Morsi came recently to New Delhi seeking economic and defense cooperation with India. He also advocated for enlargement of the BRICS to include Egypt as well thereby changing the grouping to E-BRICS. 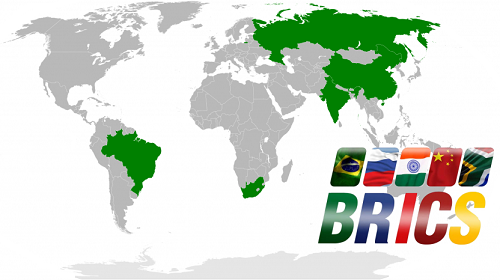 BRICS is a serendipitously created international grouping without any serious initial thoughts about its charter. Having said that it is a reality now and we must maximise our participation and derive maximum geo-political benefit from it. The five members grouping inadvertently have two tiered membership de facto. Russia and China are the permanent members of the UNSC and the other three are aspiring candidates for permanent membership. Both Russia and China are major partners in the Shanghai Cooperation Organization (SCO) an anti-West multilateral security framework in Central Asia. Both of them conduct joint annual military exercises under the framework of the SCO to develop inter-operability of armed forces. Russia is still China’s largest arm supplier as China remains under Western arms embargo following the Tiananmen Square massacre of protesting students. India has only an observer status with the SCO and has been made to wait on sidelines. China has steadfastly refused to increase the active membership of the SCO with a view to denying India a larger sphere of influence. Since the strategic interests of these two dominant members of the SCO converge and their policies are much more harmoniously coordinated in the UNSC by virtue of their being permanent members, one wonders if these two SCO members will become the puppet masters of the BRICS driving its strategic and security agenda. India must remain aware that following improvement in bilateral relations between India and US, both Russia and China have grown concerned about India’s strategic intentions and aspirations though for entirely different reasons. Moscow is miffed because India no longer offers a ready and automatic market for Russian substandard military hardware. Repeated delays in the delivery of refurbished Admiral Gorshkov or INS Vikramaditya is indicative of Putin’s displeasure conveyed diplomatically. China remains paranoid about being contained by the nascent but de facto G-2 of India and the US especially after the US pivot to Asia and its strategic retreat from South West Asia. China has done anything and everything to deny India a significant role in the international arena whether it is the UNSC permanent membership, membership of NSG, MTCR, Australia Club or enlargement of ASEAN plus frame work to ASEAN plus six instead of ASEAN plus three. China is already the largest arms supplier to Pakistan and has several thousands of PLA soldiers in POK. China has started to use the Gwadar and Karachi ports as naval bases. Both Russia and China have overtly expansionist aims. Putin doctrine envisages re-establishment of the former territory of the Soviet Union under Russian control. Xi Jin-Ping’s signature slogan of “China dream” involves grabbing land, sea-based and other natural resources under the elastic concept of “core issues” and protecting “Chinese sovereignty”. Russia has also started to engage Pakistan both economically and militarily. President Putin visited China as the first foreign country after re-claiming the presidency of Russia. Hu Jintao’s first stop was also Russia when he assumed Chinese leadership. Similarly, Xi Jin-Ping ‘s holy pilgrimage to Russia (just before the Durban summit of BRICS) after becoming the new paramount leader of China is worth taking notice. What we are witnessing is essentially an emerging RCP (Russia, China, & Pakistan) geo-political axis with wider strategic implications for India. “We invite our partners to gradually transform the BRICS from a dialogue forum that coordinates approaches to a limited number of issues into a full-scale strategic cooperation mechanism that will allow us to look for solutions to key issues of global politics together”. Putin also plans to announce the creation of a BRICS Business Council to promote trade and investment within the group and help launch multilateral business projects. The group leaders will also endorse plans to create a joint foreign exchange reserves pool and an infrastructure/development bank besides promoting intra-group trade and investments. Other Russian suggestions include creating a network of “informal political and working-level mechanisms to strengthen coordination”, introducing rotating presidency, drafting a long-term “BRICS development strategy” and launching “a dialogue on ways, pace and concrete forms of possible institutionalisation of the BRICS”, including the establishment of a “permanent secretariat”. India’s analysts and strategic thinkers have either been very gloomy or very “naively musical” in embracing the BRICS and its future agenda. A balanced, cautious, middle of the road and well calculated strategic response to the BRICS challenges is required without having “great expectations” for the moon. Instead of shying away with security based multilateral groupings, time has come for India to embrace such groupings to safeguard India’s strategic interests. A resurgent India must learn to be proactive and not reactive in execution of her foreign policy. 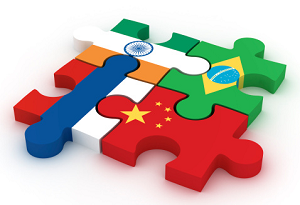 India should present a formal charter for the BRICS and minimum criteria for future membership. Future membership of this group should be criteria based and not driven by Chinese or Russian strategic interests. Here one would agree with the Russian suggestion for freezing the BRICS membership for next 3-4 years. India, simultaneously must do the necessary ground work and home work so that the “enhanced” BRICS does not end up swallowing and eventually digesting the “IBSA” where India has been one of the prime movers. India must enlarge the “IBSA” to “IIBSAA” (India, Indonesia, Brazil, South Africa & Argentina) in order to make this block of democracies more relevant in the international fora. This would require two other “developing democracies”, namely Indonesia and Argentina to be invited to join the “IBSA”. Both China and Russia are not true democracies and do not deserve a seat on the enlarged “IIBSAA”. In bilateral meetings with Putin and Xi Jin-Ping on the sidelines of BRICS, Prime Minister Dr. Man Mohan Singh must demand full membership for India in the SCO with a change in its charter to rename it as Solidarity and Cooperation Organization instead of Shanghai Cooperation Organization. Such a deft move by India will prevent “the SCO tail wagging the BRICS dog” in contentious geo-political issues and will simultaneously increase India’s strategic footprints in Central Asia. India must ensure that she does not endorse either Chinese or Russian hegemonic claims or ambitions as the BRICS takes a higher geo-political profile. As a precondition for securitisation of BRICS, India should also demand that BRICS formally adopt a joint declaration on the enlargement of the UNSC at the conclusion of the Durban Summit. India should insist that all the BRICS members must categorically endorse the UNSC permanent membership for India, Brazil and South Africa with full veto powers. There should not be mere platitudes coming from China and Russia on this important issue if the BRICS has to assume a greater role in international geo-political affairs. In the final analysis, India must systematically strengthen up her comprehensive national power (CNP) in order to have gravitas in international arena whether it involves UN, BRICS, SAARC, APEC, AEC, ASEAN or ARF. India must do multi-dimensional internal reforms, improve the infrastructure, energize the manufacturing sector, harness her youth power, modernize her armed forces, increase the budgetary allocation for her security needs and develop a rational and pragmatic pro-active foreign policy in order to safeguard her geo-political interests. Published on Boloji with permission.